The Ginkgo Panda Babies 3PC Childs Set, Light Pink are great for little boys and girls alike. Made for little hands to use for and made of stainless steel for easy cleaning, kids and adults both will like using this three piece set. 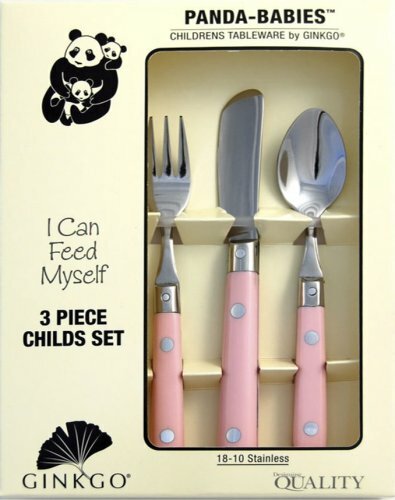 The set includes one fork, one spoon and one knife. This three piece set is also available in Light Blue and Spring Green so you can mix and match your collection. This Three PIece set also makse a great birthday gift for small children. Easy to use, colored for kids, dishwasher safe for adults-how can you go wrong.